در طراحی ساختمان‌های بلند، سه پارامتر مقاومت، سختی و پایداری بسیار مهم می‌باشند و هر چه ارتقاع ساختمان بلند‌تر می‌شود تاثیر سختی و پایداری در طراحی بهینه سازه، بیشتر می‌گردد و اثرات این دو فاکتور، جهت طراحی در برابر بارهای جانبی باد و زلزله، غالب می‌گردند. بهترین روش برای ارضا‌کردن این دو فاکتور، استفاده از فرم‌ها و مدل‌های ابتکاری سازه‌ها، به شکلی که ضمن حفظ سختی، با کاهش تغییر شکل‌ها و دریفت‌های ناشی از بارهای جانبی، پایداری سازه را افزایش دهد. سیستم قاب فولادی با کمربند خرپایی و مهار بازویی، یکی از سیستم‌های ابتکاری و جدید در سازه‌های بلند می‌باشد که استفاده از آن باعث کاهش قابل ملاحظه‌ای در مقادیر مصرفی فولاد سازه‌ای و هزینه های احداث ساختمان بلند می‌گردد. 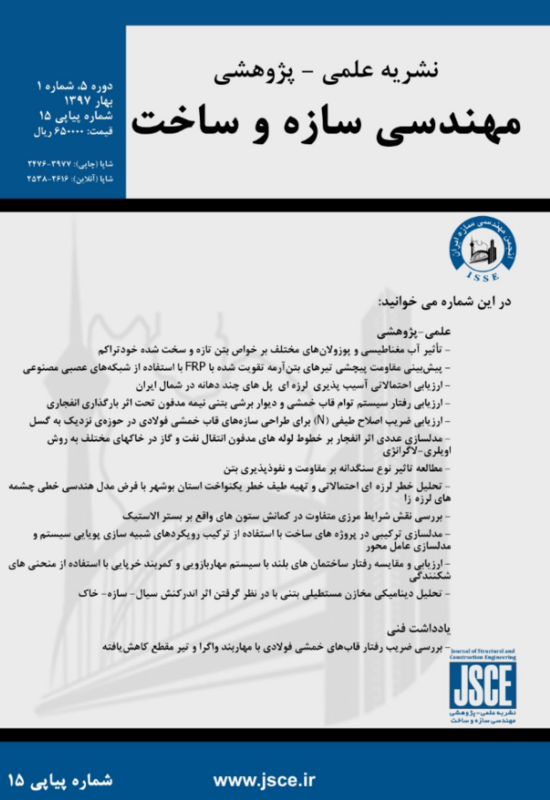 در این تحقیق، دو قاب 5 دهانه 30و50 طبقه 2 بعدی بر اساس آیین‌نامه‌های رایج ایران با دوسیستم قاب خمشی و کمربند خرپایی با مهار بازویی، بارگذاری و در حالت LRFD طراحی گردید و سپس با استفاده از نرم افزار SAP2000 و روش تحلیل تاریخچه زمانی و اعمال 12 رکورد زلزله مختلف به سازه، مقادیر تغییر مکان‌ها استخراج و ماکزیمم دریفت نسبی طبقات هر قاب محاسبه گردید. با تعریف سه آستانه عملکردی IO، LS و CP و بر اساس شدت شتاب هر رکورد زلزله، مقادیر تابع احتمال گذشت دریفت سازه از آستانه-های عملکردی تعریف شده محاسبه گردید و پس از ترسیم منحنی‌های شکنندگی هر رکورد و مقایسه منحنی‌های شکنندگی حالت-های مختلف، نتیجه‌گیری شده‌است که استفاده از سیستم کمربند خرپایی و مهاربازویی در قاب‌های2 بعدی30 و50 طبقه، به طور متوسط به میزان12 تا 28 درصد باعث کاهش احتمال فراگذشت دریفت ماکزیمم طبقات از آستانه‌های تعریف شده می‌گردد. In the design of high-rise buildings, three parameters such as resistance, hardness and stability are very important and when the height of building rises, effect of toughness and stability in optimum design will be dominate more than of the effects of these two factors against the lateral loads from wind and earthquake. The best ways to satisfy these two factors is the use of innovative forms and models of structures, so that, while maintaining stiffness, reducing deformation and drift caused by lateral loads, increase the stability of the structure. Outrigger and belt truss system are one of the innovative systems in high-rise structures that use it substantially reduces the consumption of structural steel and construction costs are high. In this research, two 2D frame with 5 spans and 30 and 50 stories according to the Iranian codes were designed in two cases of: the moment frames and frames with outrigger and belt with. Then maximum displacements of nodes and maximum inter stories drifts calculated for every earthquake records with use of SAP2000 software and time history analysis and has defined three different threshold IO, LS, and CP and acceleration of each record based on the severity of the earthquake. Then curves were plotted for each case; the results indicate that the outrigger and belt truss system would reduce the maximum inter story drift about 12 to 28 percent. Anagnos T, Rojahn C and Kiremidjian A. (1995) “NCEER-ATC Joint Study on Fragility of Buildings “Technical Report NCEER-95-0003 January 20. Sadraddin H. (2015) “Fragility Assessment of High-Rise Reinforced Concrete Buildings“ http://scholarworks.wmich.edu/masters_theses. Akshay A, Khanorkar M, Denge S. V. Raut, Dr. S. P. (2016) “Belt Truss as Lateral Load Resisting Structural System for Tall Building: A Review “IJSTE - International Journal of Science Technology & Engineering, Volume 2, Issue 10. Taranath, Bungale s. (1988), “structural analysis & design of tall buildings”, Mcgrow-Hill Book Company. Kennedy, R.P. Cornell, A.C. Campbell, R.D. Kaplan, S. and Perla, H.F. (1980) “Probabilistic seismic safety study of an existing nuclear power plant", Nuclear Eng & Design, page 59(2). Kircher, C.A. and Martin W,(1993) , " Development of fragility Curve for Estimating of Earthquake damage Work Shopon Continuing Action to Reduce losses from Earthquake , Washington ,Dc : U.S.Geological Survey. Anagnos, T Rojahn, C and Kiremidjiam, (1995) “ATC joint Study on Fragility of Building", NCEER-95-0003, Applied Technology Council, CA. Shinozuka, M, Saxena V, Deodatis G and Feng M., ( 2001) , "Development Of Fragility Curve for Multi – Span Reinforced Concrete Bridge", Dept. of Civil and Environmental Engineering , Princeton University. Murao, O and Yamazaki, F, (2000), “Development of fragility curves for buildings in Japan”, Confronting Urban Earthquakes: Report of Fundamental Research on the Mitigation of Urban Disasters Caused by Near-Field Earthquakes, pp. 226-230. Smyth, A, (2004), “Probabilistic benefit-cost analysis for earthquake damage mitigation: Evaluating measures for apartment houses in Turkey", Earthquake Spectra, 20(1), February. Arizaga , G, (2006), “Earthquake induced damage estimation for steel buildings in Puerto Rico", A thesis submitted in partial full-time of the requirements for the degree of master of science in civil engineering university of Puerto Rico . Bekir Özer AY1, M Altuğ ERBERİK and Sinan AKKAR, 3–8, (2006), “Fragility Based Assessment of The Structural Deficiencies in Turkish RC Frame Structures”, First European Conference on Earthquake Engineering and Seismology, Geneva, Switzerland, Paper Number: 593. Aziminejad, A.S. and Moghadam, A, (2007), “Effects of strength distribution on fragility curves of asymmetric single story building", Proceedings of the Ninth Canadian Conference on Earthquake Engineering (June 2007) Ottawa, Ontario, Canada. Hoenderkamp, J. C. D. (2008). "Second outrigger at optimum location on high rise shear wall." The structural design of tall and special buildings 17: 619-634. M. R. Jahanshahi, R. Rahgozar, (2013) ,” Optimum Location of Outrigger-belt Truss in Tall Buildings Based on Maximization of the Belt Truss Strain Energy “ International Journal of Engineering, Vol. 26, No. 7. Akkar, S; Sucuoglu, H and Yakut, A, (2005), “Displacement based fragility functions for low- and mid-rise ordinary concrete buildings”, Earthquake Spectra, 21(4), pp 901-927. Anagnos, T; Rojahn, C and Kiremidjian, A S, (1994), “Building fragility relationships for California”, Proceedings of the Fifth U S National Conference on Earthquake Engineering, pp. 389-396.